Today started with a surprise: it was raining – not cold but raining. So the trip to the first temple of the day was short but as we walked through a little basar with no good roof we emerged covered with dirty drops. The temple itself wasn’t that exciting either. 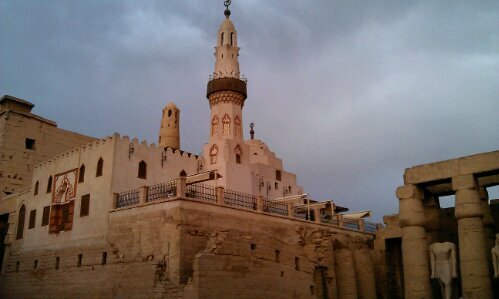 It had well preserved colourful walls but it was small and loads of birds were nesting and therefor shitting there. If you think about what to skip on a tour like this, I would suggest the Chum temple in Edna. 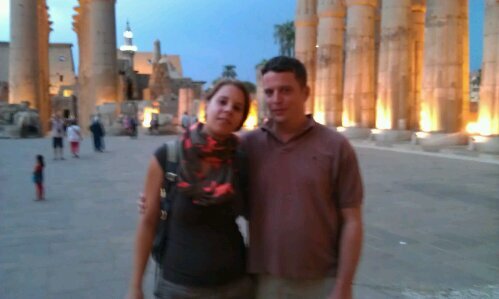 After some more hours we arrived back in Luxor and we went to see Luxor temple. From my point of view this was the nicest but maybe this was also because it was still not so hot and we were there at dusk admiring it nicely lit. And time was running as this was our second last day on the trip. And even though we had to get up very early the next morning, we had a nice and quite long evening with some fellow travellers. About the people on the ship anyway: having expected lots if old people we were happily surprised that we weren’t the youngest on the ship. Well we were probably still below average but most people were only middle aged and quite fit and we found a group of very nice people we spend the evenings with. Saying that the ship had a high number of mother daughter couples. One group was even a couple with both their mothers. 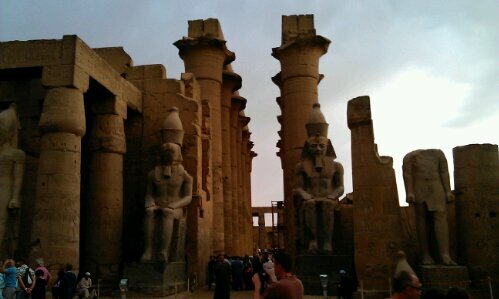 This entry was posted in Egypt and tagged Esna, Luxor, Nile cruise, Ruins, Temple by kathatravelling. Bookmark the permalink.